With every line item on budgets being closely evaluated these days, team building may sometimes seem like a lavish expense that companies can do without. However, dysfunctional teams will cost a company more than the investment they’d make in building a goal-oriented, functional, and well put together team. Click the website link to seek out much more information concerning it. This is because when changes and restructuring occur, especially in unstable times, companies cannot afford to forget about the teams that will forge ahead despite the numerous challenges before them. During any economic downturn, such as we’ve recently witnessed, getting things done and attaining results in a cost-effective manner is of the utmost importance. And one person seldom accomplishes business success that goes above and beyond expectations. Teams are forged for the specific purpose of achieving goals that are bigger than any individual could take on alone. However, the strain caused by these difficult economic conditions may hinder progress and make it difficult for teams to function efficiently. Cuts in budget and employment may require people to work together in ways they haven’t before, making the formation of new teams a prominent reality. Fear is an influential factor that drives employees to focus their attention on protecting their individual job security, rather than working to benefit the team, the company or its customers. Left unattended, these conditions can create non-productive, inefficient teams. 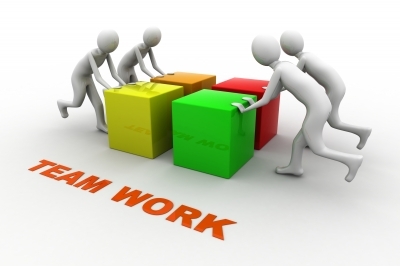 Consequently, creating cohesive, productive teams takes more than contrived team building activities. It requires strong leaders, such as those produced by Dale Carnegie Training, within the company who can motivate the individual employees to create an effective team. The foundation of such a team is a clear vision that unites the group. Establishing trust, accountability and open communication will empower each person to contribute their best to the team’s cumulative efforts. On any team, every person is responsible for its success. Taking time to train the individuals to work well together saves companies money over time and lays the groundwork for both short-term and long-term success.